You stop fearing the devil when you’re holding his hand… Nothing much exciting happens in Violet White’s sleepy, seaside town until River West arrives. He rents the guesthouse behind Violet’s crumbling estate, but as strange and terrifying things begin happening, Violet can’t help but wonder whether the boy living in her backyard is somehow responsible. Is River just a liar with a crooked smile, pretty eyes, and vague past? Or could he be something more? Violet’s grandmother always warned her about the Devil, but she never suggested that he could be a handsome boy who likes napping in the sun, who loves coffee, who kisses you in the town cemetery, who makes you want to kiss him back just as – if not more – passionately. The problem is that Violet is already head-over-heels in love, which makes it hard to think straight. And in Between the Devil and the Deep Blue Sea, readers will soon realize that this is just how River likes it. April Genevieve Tucholke’s debut YA Gothic novel will make those who love classic Gothic novels, black and white films, and star-crossed lovers very happy indeed. As only great Gothic novelists know how, Tucholke blends a setting of decaying decadence and characters who are wrapped up in their pasts with a Gothic plot line that you won’t soon forget. In fact, it’s the kind of creepy tale that might be the stuff of nightmares, but for me, caused a sort of macabre fascination. (If this were actually my reality rather than merely the plot of a novel, I would mostly definitely felt differently, but as it is, I’m able to stay a step removed, basking in the creepy glory of it.) From the White family’s decrepit, sprawling mansion and estate to the mouldy mausoleum where they house their dead and the weather that just seems to feature a little more rain, thunderstorms, and fog than might be normal, Tucholke set out to create an atmospheric world that screams Gothic romance, and she certainly succeeded on all accounts. Add in the mysterious and scary things that begin happening in Violet’s small town soon after River makes it his home, the layered allusions to some of the best Gothic novels and stories, and the fashions and films of a bygone era and Between the Devil and the Deep Blue Sea becomes a pitch perfect story that doesn’t let readers down by the time the mysteries have been unravelled. Now, in case you’re planning to read this book, then I won’t reveal the mystery or even dissect any of the creepy plot points because I know that you’ll want to discover them for yourself. What I will say, however, is that a lot of what will make your skin crawl about this novel results from its theme of characters seeing things that are both horrifying or upsetting in some other way and losing control. Moreover, Violet has the sense that she can’t really trust her feelings anymore, and let’s face it, if you can’t trust yourself, then whom can you trust? Because a lot of these questions begin after River enters her life, it would be easy for Tucholke to have the path of a typical contemporary YA novel with a dose of romance and possibly “issues.” Instead, in true Victorian Gothic fashion, Rivers becomes everything readers should expect from a Byronic hero; while Violet tries to wrap her brain around it all in her own unique and strong way. Beyond the deliciously Gothic qualities of this novel, I have to say that I love the characters. Violet, in particular, drew me in from the very first page. I love how resourceful, intelligent, creative, talented, and caring she is. I love that she also has a side that can be suspicious when the people she knows and meets deserve it. And of course, I love that she’s a character that can prove to be both strong and romantic at the same time. What I loved most about her, however, was that she has an unshakable connection with her ancestors, especially her grandmother, Freddie. With parents who neglect the needs of her and her twin brother Luke, it would be easy to become jaded, but instead, we meet a character that takes Freddie’s advice and warnings to heart in a way that makes this deceased figure alive for readers. If Tucholke can do that with characters who died five years before the novel begins, then just wait till you see what she does with the secondary characters who are alive and mostly well. 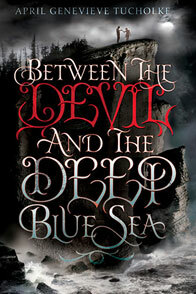 If you’re looking for a creepy and romantic book with a fabulous cast of characters, then you have to pick up Between the Devil and the Deep Blue Sea today and then sit back and anxiously wait for the sequel, Between the Spark and the Burn, to release in the summer of 2014. Buy Between the Devil and the Deep Blue Sea today and benefit from 10% off the regular price!